it over at the end. The album is also dedicated to human floes, to those who helplessly rock on the waves of the Mediterranean Sea and melt so fast that no one even notices it. The album is also about the increasing heartlessness and indifference , concerning fear and its abuse, and prejudice as well. 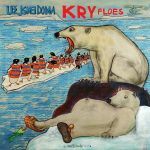 The album Floes will be released on Sept.7th, 2018 and the release party will be the day after in the northernmost town in the world – Longyearbyen on Svalbard on Sept.8th..